18+. New Players only. Min £10 buy-in to get £50 bonus. 24 x (Bonus) wagering reqs apply. Bonus valid for 30 days (bonus and winnings removed). Certain deposit methods only. Bets covering 67% or more of Roulette table don't count to wagering. T&Cs Apply. Coral Casino will then reward you with a bonus (Welcome Bonus is for new players only). The terms and conditions of the bonuses vary between different casinos and might also change over time and between different countries, so it is important to compare the different offers and read the T&C for Coral Casino before signing up. Coral Casino was founded in the early 2000s, so it’s not exactly a new kid on the block. However, the interest in this particular casino brand is on the rise and Coral is experiencing a revival, if you will. 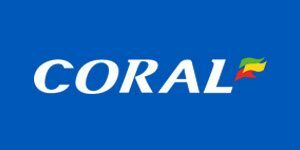 The site is managed by Coral Interactive (Gibraltar) Limited, a company that forms part of the Gala Coral Group, a longstanding enterprise in the iGaming business. Coral Casino is a UK-facing website with a license issued by the Gibraltar Licensing Authority and a well-equipped casino lobby, not to mention the outstanding sports betting section, live casino section, and separate bingo and poker rooms. With tight competition, a website can’t last a whole year in the market without being armed with remarkable software. The software is precisely one of the primary reasons why Coral Casino has stood the test of time and keeps running. Players face an extensive number of high-quality casino gaming options once they step into the Coral Casino world, and they love it. Some of the more notable software providers include Playtech, an industry giant, IGT, an experienced veteran, NetEnt, the expert on video slots and Evolution Gaming, the expert on live dealer games. Without the necessity to download anything you can access games made by mentioned developers and studios such as Realistic Games, SG Interactive, Quickspin, Bally, Ash Gaming, Barcrest, WMS, Genesis Gaming, and Red Tiger Gaming. The casino is divided into slots, roulette, blackjack, table games, jackpots, video poker and other games (a category that contains Heads or Tails, keno and Dice Twister, among others). The online slot machines available at Coral Casino are of highest quality and range from the simplest of slots to intricate new-generation multi-feature machines. It comes down to the player’s preference – video slots are there, classic fruit machines are there, jackpots are there, you just have to pick them. If you don’t really know where to start you can make use of the Top Games filter and see what the trending titles are. At the moment of writing slots such as Batman Begins, Epic Ape, Justice League, Sakura Fortune and Legends of the Jaguar are the most popular. Also, there’s no way you can make a mistake with all-time favourites like Rocky, Gladiator, Fruit Mania and Beach Life. In the table games section, Coral Casino has stacked several attractive games that are rarely found anywhere else. Titles like Diamond Bet Roulette, Red Dog, Age of Gods Roulette, Tequila Poker and Hi-Lo Premium are all available. Blackjack and roulette have their separate pages, containing such titles as 3D Roulette Premium, Penny Roulette, Dragon Jackpot Roulette, Double Attack Blackjack, 21 Due Blackjack and Blackjack Peek. Players who are into video pokers are bound to have fun at Coral Casino. The website is home to all the most wanted online poker machines, namely Aces and Faces, Joker Pokers, Deuces Wild and Jacks or Better. Care to find more unconventional gaming items? Then make a stop at Jackpot Darts, Bonus Bowling, Card Brag and Roller Coaster Dice. 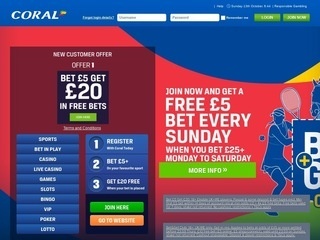 Coral’s online live casino has gone through a revamp process in 2015 and is now described as an improved and highly enjoyable gambling experience. The site offers realistic casino gaming through the user’s laptop, PC, tablet or mobile. The whole ordeal is rather high-tech and, of course, supported by an array of professional croupiers. There are Coral exclusive tables, mostly focusing on blackjack and roulette games, and a set of other popular live dealer game variants such as Live Baccarat, Live Hi Lo and Live Hold’em Poker. The games come complete with guides and features that increase the player’s control over the gameplay. You’ll be happy to know that Coral Casino does not charge any fees in the deposit process. Funding your account is free and you can do it by using Visa or MasterCard debit and Visa or MasterCard credit card, as well as PayPal, Skrill, Skrill 1 Tap. Neteller, EcoPayz, PaysafeCard, and Connect (an instant payment method exclusive to Coral Casino). The minimum deposit required to get an approval of the transfer is £5, while for cash-outs there is no minimum. Withdrawals take 2-5 working days if requested via card and are instantaneous if directed to an e-wallet. Finding a customer dissatisfied with the service of Coral Casino is practically a mission impossible. The site has had enough time to improve any of the drawbacks it may have had in the past, and now it runs like clockwork. It is very well suited for UK players and has a spectacular game variety. Quite a few countries are restricted from playing, but practicing responsible and safe gambling is always better than drawing clientele from restricted areas. Coral is fast with payouts and has a low minimum deposit, and any gamer online would be foolish not to make use of that.